Enjoy an artful design and beautifully warm finish in this transitional square wall mirror from Uttermost. Heavy iron creates a frame with a charming cutout that reveals a 4mm thick mirror. Its champagne finish brings an enticing warmth to a casual or semi-formal space. This transitional square wall mirror dresses up a family living space or master suite. 24" wide x 24" high x 2 1/4" deep. Hang weight is 9 lbs. Glass only section is 19 1/2" wide x 19 1/2" high x 1/4" deep. Surrounding frame is 2 1/4" wide. 4mm thick mirror glass. 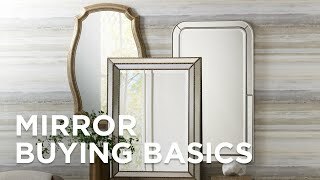 Transitional square wall mirror from the Uttermost Rania Mirror collection. Vertical installation only. Welded sawtooth hanger with anchors and screws pack included. Antiqued golden champagne finish. Heavy iron frame construction.